With the ever growing popularity of open workspaces, much to the workers’ chagrin, it can be difficult to focus on work. Open workspaces lead to distract-ability, and less productivity, which makes for a pretty miserable work day. One way to increase productivity and minimize external distractions is by utilizing noise cancelling earbuds. Finding great noise cancelling earbuds can be very overwhelming. There are so many different brands out there, each with their own style and features. In an effort to help reduce some of the overwhelm, we’ve compiled a list of ten of our favorite noise canceling earbuds, taking into consideration well-known brands, wireless vs. wired models, and available features such as noise cancelling vs. noise isolating, calling capability and range Bluetooth range. At the conclusion of this article, we’ll discuss the best options for athletes, office workers and music lovers. Below we’ve compiled a list of our favorite noise canceling earbuds so you can make an informed decision that best fits your needs and desired features, avoiding all of the overwhelming choices. Mindbeast wired headphones have high-quality bass and powerful noise isolation. Ultra clear sound and in-ear noise technology reduces ambient noise by at least 90%. Three pairs of replacement earbud tips ensure a comfortable and secure fit. Beautifully designed, they have a unique look that allows you to stand out from the crowd while still being sweatproof and lightweight. They are compatible with any device with a standard jack. They have a microphone so you can take calls, and because they are wired, they never have to be recharged. The wire is a heavy duty wire covered with thick plastic, extending the life of the headphones. They come with a leather zippered case that is waterproof and dirt-proof. TaoTronics Active Noise Cancelling Headphones feature-packed wired headphones have active noise cancelling functionality, reducing external noise by up to 25dB. These earbuds have a Monitoring Mode, allowing you to lower the volume with the press of a button, enabling you to hear the important things around you, like airline announcements. They are made of light-weight aluminum alloy that looks sleek and elegant, and feature buttons for controlling the volume of audio and incoming phone calls. These feature a built-in noise cancelling microphone, which enables crisp sounding phone calls and undisturbed voice transmission. 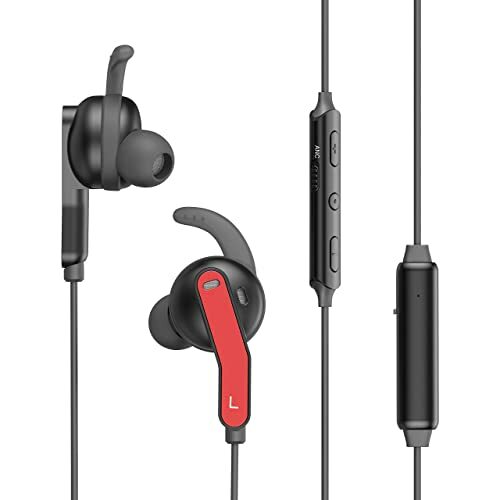 They include extra sets of earbuds as well as ear hooks and come with an airline audio adapter, travel pouch, and micro USB cable. 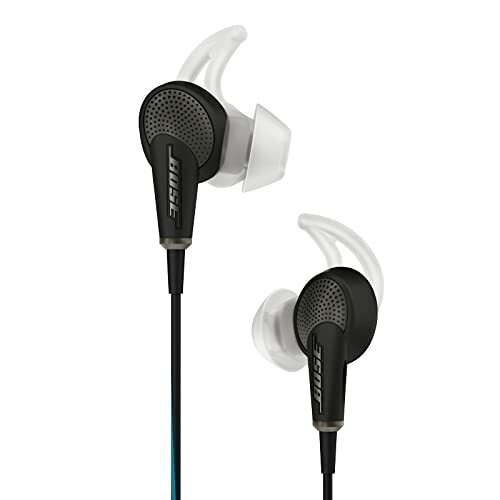 Bose QuietComfort 20 Acoustic Noise Cancelling Headphones are high-end wired headphones have active noise cancelling functionality and have an Aware Mode, allowing you to lower the volume with the press of a button, enabling you to hear the important things around you, like airline announcements or a quick chat with a friend. They have an inline microphone and one-touch answer/end controls for easy switching between your calls and music. Proprietary StayHear tips provide a soft, secure fit and complete seal in your ear. Unfortunately, they are specifically designed to work with selected Apple or selected Samsung and Android devices, so read the description very carefully to ensure that they will work with your device. 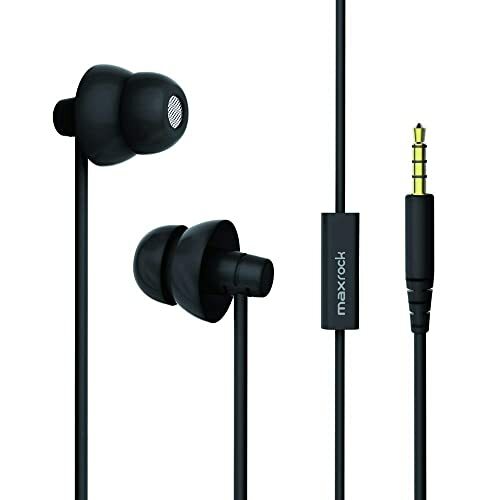 MAXROCK Noise Cancelling Sleep Earbuds are wired, noise isolating headphones are specifically made for sleeping. They are super light and soft, making them ideal for wearing for all 24 hours of your day. The flexible noise isolating design helps to muffle your partner’s snoring or your roommate’s TV. They work great with white noise or other sleep apps. The tips are made of a soft, flexible silicone, making them comfortable for sleeping. They offer inline microphone and controls. If you are looking for something with good bass, these are not what you are looking for. These are for sleeping. It’s difficult to sleep with bass thumping in your ear. AKAMATE Active Noise Cancelling Earphones are wireless earbuds that claim to block out 92% of background noise. They provide deep bass and use Bluetooth v4.2 to offer stable pairing and skip-free audio for a distance of up to 33 feet. 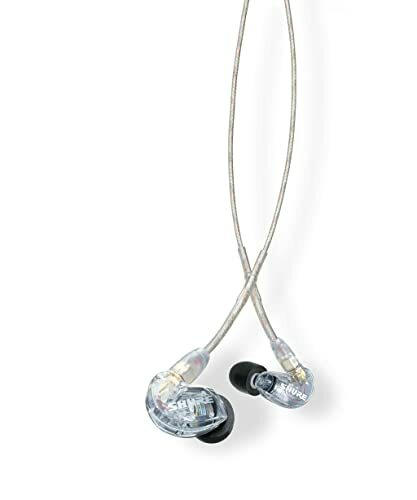 They feature an integrated microphone, comfortable ear tips, and ergonomic ear hooks. These types of ear hooks do not go on the outside of your ear, rather they “hook” onto the inside of your ear. One really unique feature is that they are magnetized so that you can wear them around your neck like a necklace when you aren’t using them, and you won’t have to worry about them sliding off or getting tangled up. The battery charges quickly and lasts a good while with 1.5 hours of full charge supporting up to 8 hours of audio playback with the Active Noise Cancelling technology turned off. However, when Active Noise Technology is on, the battery only lasts about 4 hours. 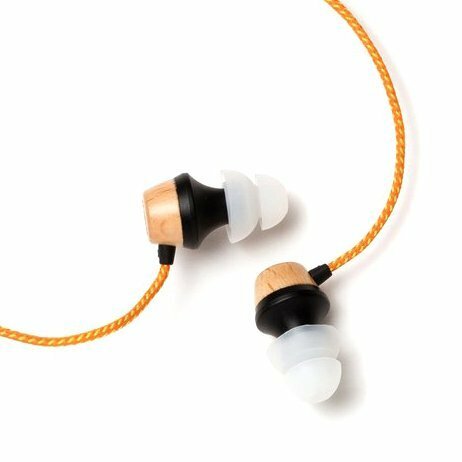 Symphonized ALN Premium Wood Noise Isolating Earbuds are wired noise isolating earbuds are made from natural, genuine wood. They feature a dual flanged ear tip, ensuring a snug fit that does not fall out. They come with multiple sizes of tips and a carrying pouch. They are designed to work will any device with a standard 3.5mm jack, have a tangle-free cord and inline remote and microphone. These are excellent headphones for the casual music lover who also happens to work in a noisy environment. The microphone is great and users rarely complain about the sound quality. They come in fun colors with tangle-free cords. They are probably not great for runners or people that are really active, as the cord is pretty long and easily gets caught on things. 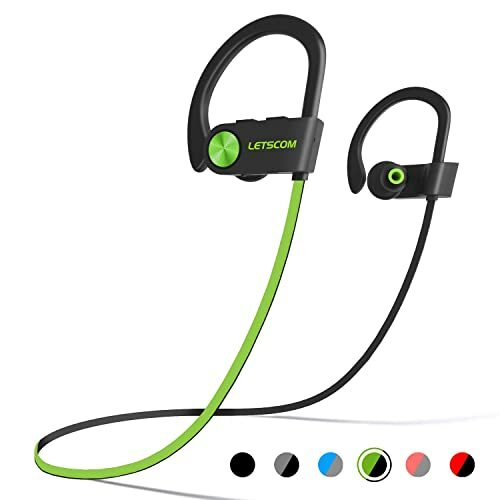 These LETSCOM IPX7 wireless noise cancelling headphones feature a built-in microphone and a waterproof design, making them perfect for working out, running, biking and hiking. They have control buttons on the headphones, allowing you to play or pause music and phone calls, as well as adjust the volume and skip tracks. The built-in lithium battery charges in 2 hours, providing up to 8 hours of usage time. They are comfortable and stable, and come with multiple ear tips in various sizes to ensure comfortable and secure wear. Shure SE215-CL are wired sound isolating earphones block up to 37dB of ambient noise, preventing outside noise from interfering with your listening experience. These claim to offer detailed sound with enhanced bass for personal use or professional monitoring. 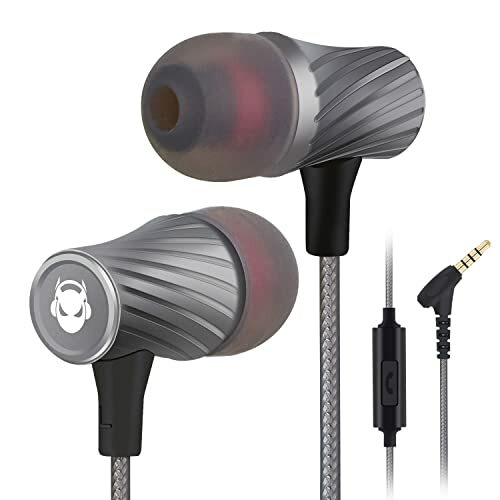 Lightweight and low profile, they are designed to rest comfortably in your ear. They come with three sizes of ear tips and a zippered carrying case. As these focus on optimizing the user’s listening experience, they do not include a microphone or inline controls. 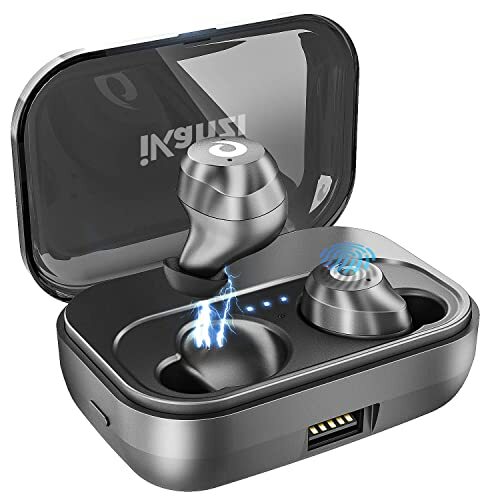 These iKanzi IPX7 wireless earbuds produce high quality audio and automatic pairing with Bluetooth 5.0. They can be powered off and recharged automatically when placed in the charging case. They have a range of 33 feet when connected and are compatible with newer Bluetooth devices. They last up to 4 hours on a single charge, but the case can charge them approximately 18 times before it needs to be charged again. So, if you keep your earbuds in the case when not in use, you should be able to enjoy them for extended periods of time. These earbuds automatically pair to one another when taken from the charging case. Amonro Bluetooth Headphones are wireless noise cancelling headphones that are lightweight and foldable, making them convenient to carry in your bag or your back pocket. While wireless earbuds are the future of portable audio, they still present compromises in battery life and connectivity. Additionally, they are easy to lose if you are not careful. These Amonro Bluetooth Headphones have a lightweight neckband, allowing you to wear your earbuds when not in use, while keeping them safe from loss and easily accessible. 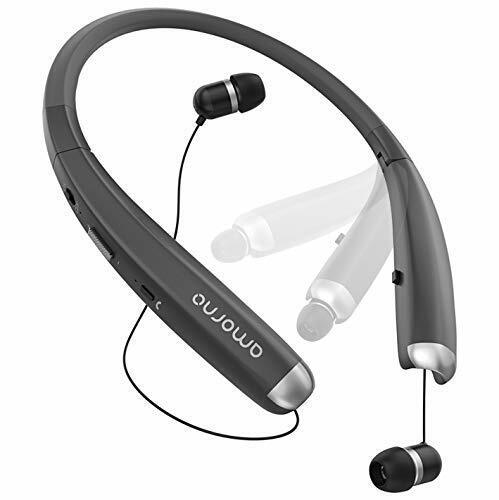 The neckband vibrates on incoming calls, ensuring that you will never miss a phone call, even in noisy environments. They also have a more stable connection with a longer range and superior battery life. Compatible with Bluetooth 4.1 devices, it has a stable connection for up to 32 feet. The powerful rechargeable battery supports more than 12 hours of talking time or 10 hours of music time. What makes the Best Noise Cancelling Earbuds? When you’re listening to your favorite music sometimes you want to be totally immersed in the experience and not hear the outside world around you. If you’re traveling, commuting, or just want to tune out background noise at home, noise cancelling earbuds are a game changer. Having this kind of technology can be a dream come true for tuning out unwanted noises and enhancing your listening experience. But not all of them are created equal, as some are certainly better than others. But what makes the best noise cancelling earbuds? There are a few factors you’ll want to look out for to distinguish the top tear earbuds from those that only drown out some of the noise. There are two different types of noise cancelling earbuds, passive and active. Passive noise cancelling headphones provide a barrier between the sound and the ear. Technically, any earbud is a passive noise cancelling device because the equipment automatically blocks some outside noise just by being there. Real passive noise cancelling devices use layers of high-density foam and other materials to block sound. However, they can effectively only reduce noise by about 15 to 20 decibels. And if you’re in a busy place or on an airplane, this isn’t going to give you a true noise cancelling experience. That’s where active noise cancelling earbuds come into play. They have a specific structure that creates a barrier to block high-frequency sound waves, as well as actively erasing lower-frequency sound waves. The headphones do this by emitting a sound wave identical to the incoming sound wave. This creates destructive interference, which essentially cancels out the sound wave from the outside, allowing the listener to hear only what is coming from the earbuds. 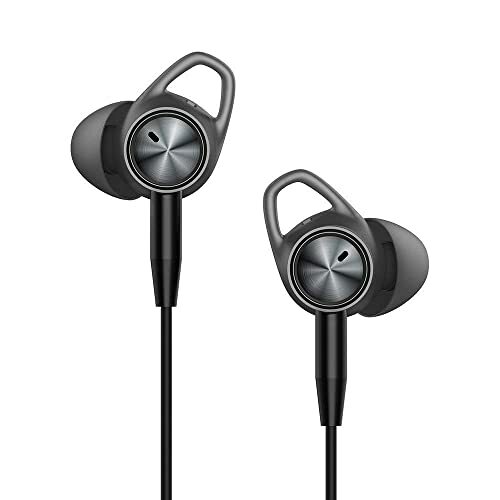 So to make sure you’re getting the best noise reduction as possible, go with active noise cancelling earbuds. Another factor to consider when picking the best noise cancelling earbuds is the way they communicate with your device. With earbuds that connect to your device via a wire, you may have more reliability on the sound because you have a stable connection. However you’ll have to put up with a limited range of movement and you’ll have to keep your device on you at all times. With wireless earbuds they give you much more freedom to move around and you don’t have to worry about the cord getting in your way. These earbuds operate via Bluetooth, which easily pairs with your device and allows you to still listen to it even if you’re in the other room. Most noise cancelling earbuds will need to be recharged, whether they are wireless or not. So be aware of what their typical battery life is like, because you don’t want to have them dying on you all the time. Most earbuds offer up to 25 hours of listening time for their battery life. Different earbuds may feel different in your ears. Not ever ear is shaped exactly the same, so you may find some earbuds are more comfortable for you than others. This is a personal preference of course, but keep in mind you will be wearing them for possibly hours on end, so make sure that they are comfortable. Yes, noise cancelling works, but don’t expect magical silence. There will still be some noise, but approximately 70% of the low ambient background noise will be filtered out, meaning that noises that come from airplane cabins, trains or noisy work environments will be filtered out. High pitched and/or transient noises, like screaming kids will still be heard. How Do Noise Cancelling Earbuds Work? The best passive noise-canceling headphones are circum-aural types that are specially designed to eNuance the noise-filtering properties. This means they have layers of high-density foam or other a different sound-absorbing material, making them heavier than your normal style headphones. Noise canceling earbuds add extra noise reduction ability, by actively taking away the lower-frequency sound waves. How do noise-canceling headphones achieve this? They create their own sound waves mimicing the noise coming in, in almost every aspect. Is active noise cancelling safe? Yes, active noise cancelling technology is safe. Recreational hearing loss is typically a result of overexposure to loud noise. According to the World Health Organization, half of hearing loss in young people between the ages of 12 and 35 may be due to the use of personal audio devices, in addition to concerts and sporting events. One reason people turn their music up to unsafe volumes is because they are trying to drown out background noise. By using Active Noise Cancelling, you are able to listen to music at lower volumes while reducing the volume of background noise, effectively protecting your hearing. Additionally, noise cancelling headphones can be beneficial to your health, since both loud noises and constant low-level noise can not only damage hearing, but interfere with sleep, raise blood pressure, and cause headaches as well. Is it okay to sleep with noise cancelling earbuds? Sure. Just be cautious with cords and make sure your earbuds are comfortable. If wearing wired earbuds, put the wire down your back to reduce any risk of strangulation while you are sleeping. If they are hurting your ears, they could be putting too much pressure on your ears, which could cause damage over time. What is the difference between sound isolating and noise cancelling? Both noise cancelling and noise isolating headphones aim to reduce the amount of sound you hear from the outside world, but they differ in how they reduce outside noise and how well they reduce outside noise. In short, the main difference is that noise isolating headphones physically block external noise in the design of the earbud while noise cancelling headphones use an electrical component to cancel the actual soundwaves. That’s typically why noise cancelling headphones take batteries, regardless of whether they are wired or wireless models. To read more about the technology, go here and here. In conclusion, remember that earbuds can be expensive, so make sure you purchase earbuds with the features that you want and need. If you rarely make phone calls with your earbuds, then maybe you can forego that feature and opt for a different model that focus on superior sound quality. Listening to music would likely require a high-end model with sufficient bass. The Shure SE215-CL is a great option for both professional musicians as well as people who just love to listen to music. They do not have inline controls or a microphone, focusing on putting out great sounding music instead of call functionality. Athletes would most likely require ultra light-weight, sweatproof models with an ear hook to prevent them from falling off. While they don’t have an ear hook, the IKANZI iPX7 boast an ergonomic design that stays put during exercise. They are comfortable and sweatproof, making them an ideal set of earbuds for use while working out, running, biking or hiking. The Symphonized ALN Premium are great for folks that work in a noisy office environment and also need to participate in conference calls. The inline controls make it easy to quickly switch between listening to music and answering calls. If you work in an environment where there is a constant, steady noise, like driving a truck or working in a factory, TaoTronics Active Noise Cancelling would be your best option as they have an excellent battery life and do a great job at muffling those constant, steady noises. If working in a factory, be sure to have the cord properly secured and out of the way.